Carly is our Lead Surgery Technician II. She studied Biology at St Catherine University, the Argosy University for Veterinary Technology. 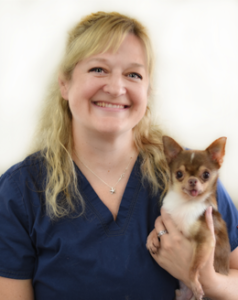 She has over 12 years experience working with animals, mainly exotics, including Sharks, fish and even Sea Turtles. Carly is a very gifted Surgery Technician and has made significant contributions to our entire team, in a very short time. In her free time, Carly likes to Scuba Dive, talk about anything Disney and spend time with her family; Chad, Chase and Logan, two dogs Toby and Stitch, and 2 cats Amelia and Lincoln.